The St. Mary Home & School Association (HSA) was founded in 1944 and has served many purposes through the years. One thing that has not changed is the support of parents for the well being of both our children and beloved school. Each year, the HSA raises over $185,000. Of this, $100,000 goes directly towards the school’s operating expenses. The balance continues to fund implementation for technology in the classrooms, teacher enrichment, school beautification and many other worthy causes. Tuition alone doesn't cover the cost of educating our children at St. Mary School, so the HSA raises funds that go directly back to the school to cover operating costs to keep tuition fees low. The Annual Fund also supports technology and classroom investments, community building activities and continuing education for our teachers to help them further develop the whole child in faith, academics and service. Our goal is 100% of SMS families to donate: The suggested tax deductible donation is $250 per family, but we welcome donations at any amount. 1) CLICK HEREto donate online. You can also donate through your specific Faith Direct account. Choose “one time gift now” and select SMS Annual Fund. 2) Drop off the completed Annual Fund forms that were mailed to your home with your donation to the front office marked "c/o St. Mary Business Office." 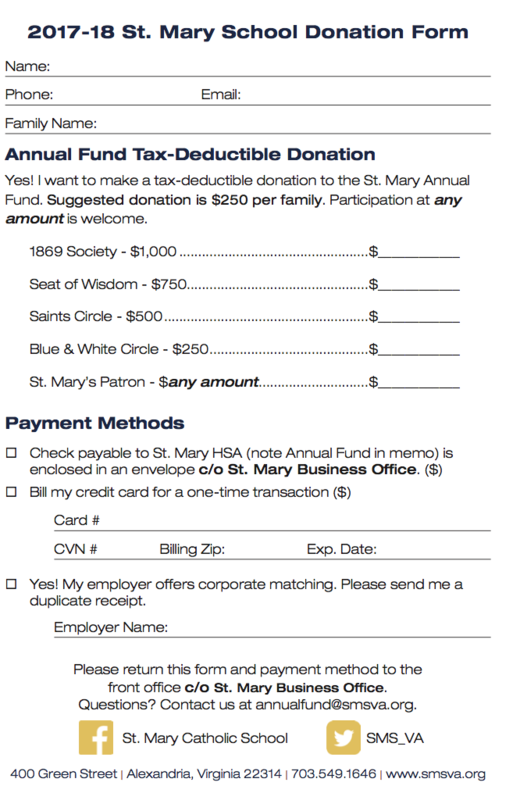 Please make your check payable to "St. Mary HSA" and note Annual Fund. Click here for a donation form. If your employer offers corporate matching, please let us know and we can send you a duplicate receipt. Please contact annualfund@smsva.org with any questions. Thank you for your generosity!